Last weekend I was at a dinner in Christ’s College, Cambridge to celebrate 40 years of women in the college (founded 1505). Women have only been allowed to study at the University of Cambridge since 1869, when Girton College was founded. Newnham followed in 1872, but even for decades after that, women were not considered full members of the university. They could study, take exams, and have their results recorded, but the awarding of full degrees to women didn’t happen until 1947, two years after the end of the Second World War. 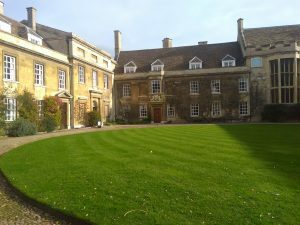 Mixed colleges didn’t get going in Cambridge until 1972, a date which means a lot to me because I was one of the first women admitted to King’s College (founded 1441). 40+ years of women in mixed colleges is a milestone, of course, and thank goodness the path has been opened up, but there were quite a few women at last weekend’s dinner who expressed the view that it wasn’t exactly something to celebrate, as forty years is a mere blink of an eye in comparison to centuries of exclusion. Even after four decades of co-ed colleges, there are still invisible barriers to women’s full equality with men in the university – and of course elsewhere. So it was with a sense of rueful pride that we raised our glasses. This entry was posted on Sunday 24th March 2019 at 3:46pm	and is filed under Daily Life, Inspirations, Musings, Travel. You can leave a response, or trackback from your own site. Love the quote – it fits so many walks of life.